This great primordial explosion supposedly brought everything in the universe into being, although why exactly it did this remains slightly ambiguous. There was belief that the universe was created as a front for the Mafia, although the scientists who developed this theory have mysteriously disappeared. Shortly after the Big Bang, at approximately 10-57 seconds, some constituents of the early universe became disgruntled with the way things were going and decided to hold their own universe. The result was the "Not-Quite-so-Big-as-the-Big" Bang. The outcome was disappointing. The new bang accomplished very little, and the two-party system of physics failed miserably since a joint decision between the two could never be reached. This bipartisan idea was basically abandoned throughout the universe and eventually faded from science. Remnants can still be seen in American politics. That Period When Everything Was Still REALLY Hot. During this phase, things were immensely hot, vaguely resembling New Jersey in summertime. Tempers were short and crime rates soared. Free quarks began roaming in gangs of two and three, and consequently matter formed. The Great Galactic Air Conditioning. The universe finally decided that it was time to install air conditioning. Things cooled slowly at first, as the universe was trying to save money on its electric bills. Things cooled faster later, when the universe got fed up with the heat and cranked the air conditioning up all the way. 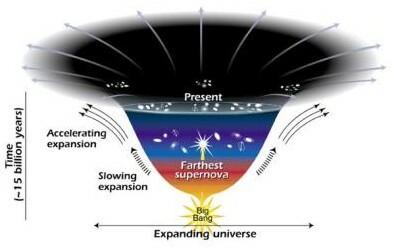 With bosons scrambling about desperately trying to lose weight, the universe was a very turbulent place. The big problem was figuring out just how to go about losing mass and just how many calories bosons could burn without endangering their health. Many tried crash diets, but only ended up gaining it all back. Several gave up entirely and went on to curse Oprah Winfrey forever as "fat particles." The final blow came when random particles adhered into the first snack foods. While very primitive, these proto-Twinkies, quasi-DingDongs and meta-Fritos made the Great Boson Diet an abject failure. Electromagnetism and the weak force eventually divorced. The forces still remain friends, however, and can occasionally be seen flirting in Switzerland and Illinois. Things proceeded in a somewhat normal manner for a while. There were no more turbulent particle relationships, outside of the normal fission and fusion. Stars were born and died, great nebulae spread out into the cosmos, planets formed, life evolved, and eventually the Bell telephone system broke up. Only a few great occurrences happened in the later stages of the universe. One very important event was the release of the album Voulez Vous by the Swedish disco band ABBA. Containing such disco classics as "Take a Chance on Me," it revolutionized the way the rest of the world looked at Scandinavian music and lent musical legitimacy to the disco sound. How the Universe Will End. Based in Madison, Wisconsin, Eric Oehler is a software developer, font designer, and frontman for an electronic band called Null Device. He wrote this satire while a student at the University of Wisconsin, Madison. The full unedited article can be found online at www.12am.com/arshot.htm.